A view through the window at Galerie F’s former location. Almost five years ago, two screenprinters envisioned a boutique gallery space that would be all about gig posters, art prints and street art. They would have regular exhibitions showcasing local, national and international artists and would focus on accessibility to make sure anyone would feel welcome walking in and leaving with an artist-made poster. 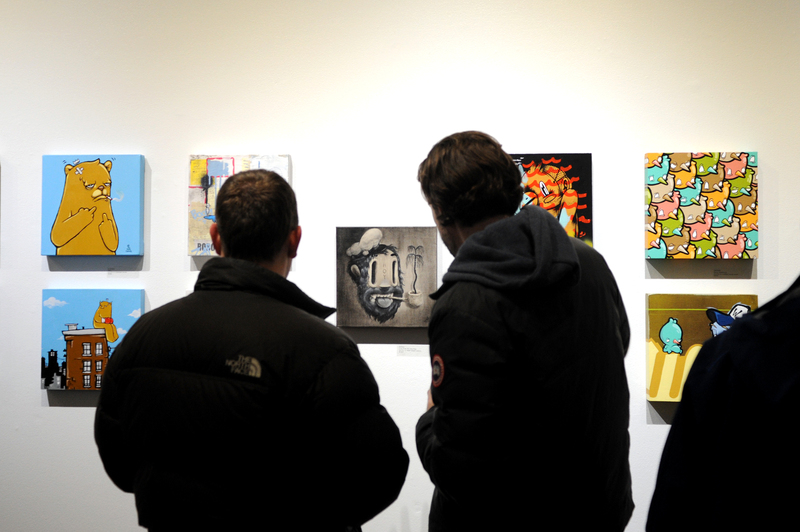 When Zissou Tasseff-Elenkoff of FugScreens Studios and street-art aficionado Billy Craven teamed up, Galerie F was born. This Logan Square space grew to become Chicago’s prime concert poster and street-art gallery. It offered an extensive and affordable collection of posters and collectibles, blurring the lines between fine art, street art and music. The gallery was open six days a week with regular hours, something uncommon among artist-run spaces. It was their open-door concept as well as their mentality that art should be accessible to every budget that set them apart. Galerie F began supporting the creative community with screenprinting classes and a library of work. “As a fan, follower, documenter and consumer of street art, graffiti and printmaking, I saw a great under-abundance of galleries and venues in Chicago that supported these mediums,” says Craven. 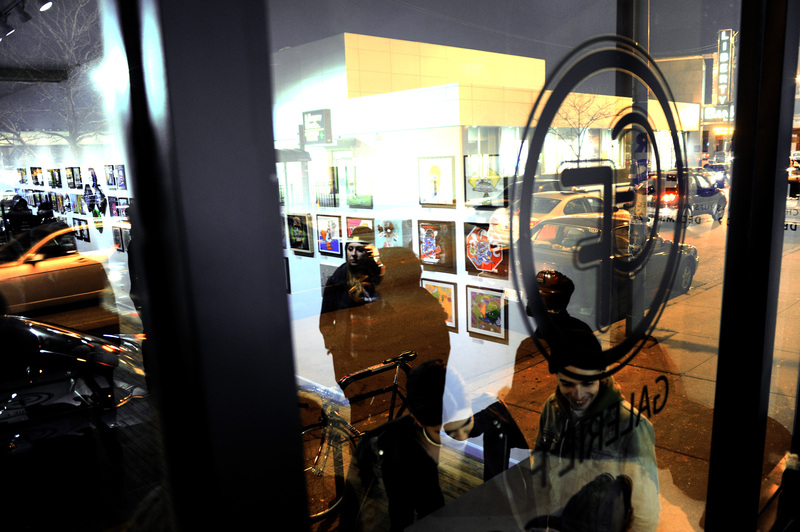 Visitors look at artwork on display at Galerie F’s former location. Following Tasseff-Elenkoff’s departure, Galerie F is going through a myriad of changes. 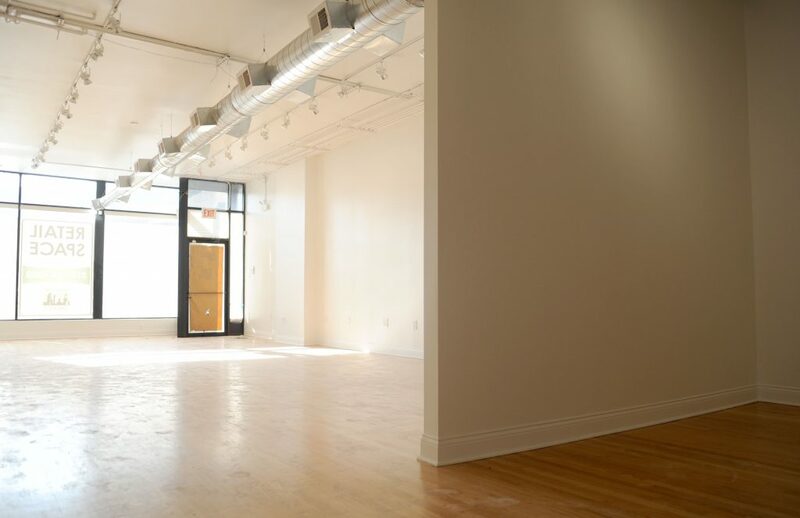 With their new year’s resolutions still fresh, Galerie F is moving into a brand new space. Craven, unveiling a revamped gallery under the direction of Laura Arnold, is refocusing on the space’s founding dreams to build even stronger bonds with the community. Craven has been a part of the street-art and graffiti world through photography. “While living in Brooklyn, I became immediately aware that something was going on. Art and graffiti covered almost every inch of the city around me,” he says. “Soaking in the life and the energy, I picked up a camera and started documenting what I saw—everything from a simple sticker or graffiti tag to a full blown mural.” Committed to introducing new and emerging artists to the scene, he has worked with names such as Sentrock, Mosher, Sick Fisher, Victor Ving of the classic “Greetings From” postcard motif mural in Logan Square and JC Rivera, who filled the city with boxing-gloves-wearing bears and collaborated with Andrew Ghrist to create the extremely popular Flamingo mural in River North, among others. Galerie F’s new space before move-in. Galerie F’s “7” opens January 13 and runs through February 5 at 2415 North Milwaukee.